Vissum’s ophthalmologists specialising in oculoplastic surgery mainly treat disorders and diseases of the eyelid, eyeball and tear ducts, but they also correct aesthetic problems linked to the natural ageing of the eye area. The area around the eyes and eyelids is particularly sensitive and our oculoplastic surgeons have an excellent working knowledge of the eye allowing them to perform highly specialised surgery. At Vissum we will help you keep your eyes healthier, see better and look better. Our surgeons will perform a complete eye examination and undertake the most appropriate treatment for you. What are the main issues resolved by oculoplastic surgery? The morphology of our eyelids not only affects our physical appearance but changes in their shape can also cause eyesight problems. Obstruction of the tear ducts, lacrimal obstruction is a common disease that causes tearing and infection. Droopy eyelids or palpebral ptosis, which affects aesthetics but can also reduce the visual field. Ectropion and entropion, causing irritation, tearing and even corneal ulcers. Abnormalities in eye movement, such as blepharospasm and lagophthalmos, the latter being more complicated to treat. Inflammatory problems, such as mild blepharitis or other more serious problems with a hyperthyroidal origin. Ageing of the skin around the eye as the face reflects the signs of ageing more clearly. Oculoplastic surgery can usually solve or at least significantly improve many of these problems. It involves simple operations, but must be done with great precision to avoid affecting visual functions. Obstruction of the tear ducts is very common and can be surgically treated by a technique called dacryocystorhinostomy, which has a very high success rate. Involuntary movements of the eyelids are very rare and more difficult to treat but they are usually controlled with regular injections of botulinum toxin into the orbicularis muscle. Excess skin on the eyelids, which sometimes gives a person a sad and tired look. Bags under the lower eyelids, usually because the fat that is within the lower eyelids seeps out producing a bulge under the skin below the eyelids. this does not cause changes in eyesight. 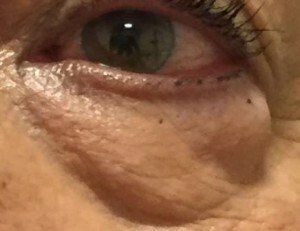 Wrinkles in the periocular region, commonly around the outer corners of the eyes and called crow’s feet. Mitigating the signs of ageing usually requires surgical treatment as there are no miracle creams that make the bags under the eyes or excess skin on the eyelids disappear. In these surgical treatments the excess skin must be removed but still allowing the perfect closing of the eyelids to prevent problems such as dry eye or corneal ulcers. To smooth out wrinkles in the periorbital region (so-called ‘crow’s feet’), Vissum’s surgeons can perform infiltrations of botulinum toxin and hyaluronic acid, both with many uses in ophthalmological and aesthetic therapies. Tumours on the eyelids and in the eye socket can be either malignant or benign. In both cases treatment requires surgery and a successful plastic reconstruction of the anophthalmic cavity. This surgery is indicated for all those processes requiring enucleation or evisceration (removal of the eyeball) as well as for treatment of small eyes, intraocular tumours, blindness or painful or unsightly eyes. Likewise, this type of surgery is also used for treatment of patients with ocular prosthesis problems such as volume loss (sunken orbit), in order to retain the prosthesis, or to make it less unsightly. VISSUM’s oculoplastic surgeons have recognised training and experience in the treatment of lesions and tumours of the lacrimal gland or eye socket, as well as fractures of the orbital bones. Also, I consent to the processing of my personal data for commercial and/or advertising and commercial prospecting purposes relating to services provided by Vissum, including sending postal mail, email and other means of communications.